Easy 5 a Day in Tesco | Supermarkets in your pocket. t’s not that consumers are lazy, they just love simple solutions rather than fiddly problems associated with eating and drinking decisions. Very likely, this underpins their apparent inconsistency when it comes to eating 5 portions of fruit and vegetables per day. Kantar World panel tells us that UK consumers barely manage half the recommended portions of fruit and veg. If we did hit the 5-a-Day target this would cost us about £470 per person per year – £9 per week or, say, £1.25 a day. Why, that’s no more than a big bag of crisps (chips)! Retailers have responded to the eat healthier trend by increasing the range of fresh produce and putting it in snack packs. But, we still stray towards the salty snacks and sweeties. Wait, there may be hope for us yet. 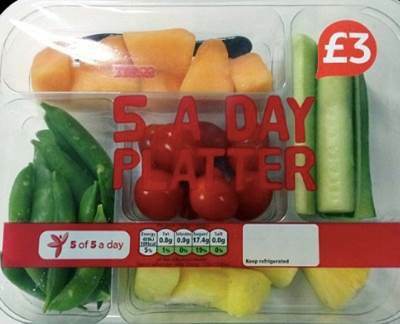 Tesco have launched an innovative 5-a-Day platter: 5 snacking portions of fruit and veggies in one pack and they don’t even list the individual produce items in the pack.The benefit to the consumer is crystal clear – you can knock off your 5-a-Day challenge in one fell swoop for £3. Why, that’s less than a pint of beer! Great idea for the well-healed, health-seeking individual but a bit rich for the income-strapped family of four.